Brenda Nibley and Alisha Nuttall on the day of the ice rink cookie build reveal, as seen on "Holiday Cookie Build," Season 1. 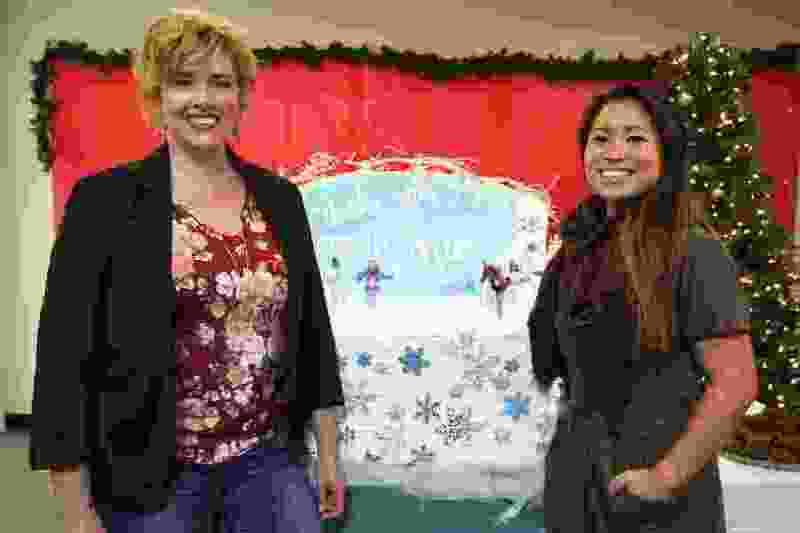 Two Utah bakers will showcase the state’s sweeter side this month, when their new show, “Holiday Cookie Builds,” airs on the Cooking Channel. During the show — which premieres Friday, Nov. 9 — Brenda Nibley and Alisha Nuttall will have the nation salivating over their edible masterpieces made with cookies and other delicious treats. 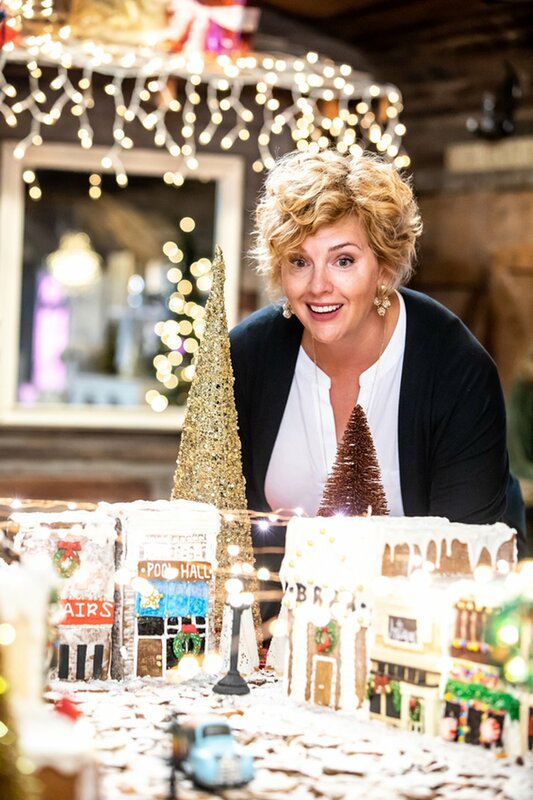 (Courtesy photo) Salt Lake City's Brenda Nibley is the featured baker on Holiday Cookie Builds, which premieres Friday, Nov. 9 on Cooking Channel. Nibley and Nuttall are television veterans — even though they’ve never worked together on a cooking show. Nuttall, owner of Cravings bakery in Pleasant Grove, has competed three times on the Food Network’s “Cupcake Wars,” losing her first try but winning a subsequent revenge episode. 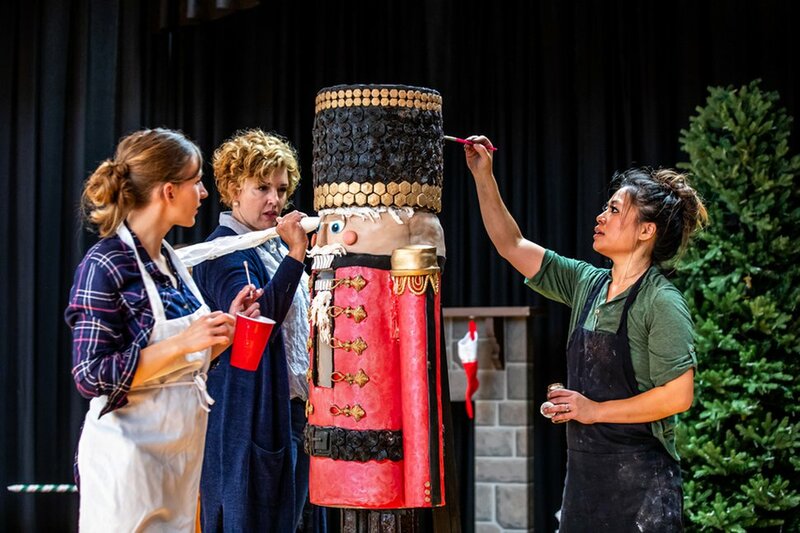 (Courtesy photo) Baking assistant, Becca Pickup (left) helps Brenda Nibley and Alisha Nuttall, put the finishing touches on a life-size nutcracker, during an episode of Holiday Cookie Builds, Season 1. Before Friday’s premiere, Nibley, who is 50, talked about how she started a second career making personalized gingerbread houses for clients, how a drone helps her make them look exact and how she and the Osmonds have a powerful connection. Her comments have been edited for clarity. How did you get into the baking business? As my children (three boys) got older, I knew I wanted to start a new career. I wasn’t sure if I should go back to school — I already have a degree in psychology. I also love to play piano, and I love music and art. I thought about music therapy. Ultimately, I decided I’d just rather make gingerbread houses. It’s such a happy thing. Even if it’s short-lived, it makes everyone feel like a kid again. Do you have any tricks for making the pieces look like exact replicas of client homes or well-known buildings? I love designing things and coming up with crazy solutions in cookies and edibles. I really like creating textures. I developed my own food-grade texture mats. You can roll the dough over them, and it makes it look like brick or stone. How did you and Alisha divide the work on the show? I can do cookie houses, and she is an incredible cake and treat maker. That’s why, for this show, the producers teamed us up. When you do a big build, you have to have both, because you need something for people to eat right away. How long does it take to create a replica? When we are filming, we literally have 2½ days for each build. So when things go wrong, we have to make it work. Fortunately, we have an incredible team at the Swirly Girls bakery (in South Jordan), where the series was filmed. They do the fondant and help bake. You couldn’t do this without having a team to support you. Everyone that has come on is so talented. I may have an idea in my head, but when we all work together, it turns out more wonderful than I could think up myself. What are some of the sites that Utah viewers will recognize? We did a really fun episode for a New Year’s party that highlighted the clock tower at [downtown’s Salt Lake City Hall] that people will recognize. I had to fly my drone above the tower to make that one. You use a drone for cookie baking? That’s what I do. I fly drones over people’s homes to get good photos. I’m not an architect or builder; I do better with photos. I started doing that after one client sent me a drone photo, an aerial view of his house, and it was amazing. The drone photos show me what it should look like when it’s sitting on my counter. So then I got my own drone and got licensed, so I can look at the rooflines, and I have a visual. I just need to get the drone high enough — as if I’m a big giant looking down onto the house. What was your favorite build this season? I did a 7-foot tall lizard for Scales and Tails Utah, a traveling reptile company that does presentations and parties with alligators, snakes and lizards. They wanted us to do a cookie build for their employee Christmas party. The lizard — an Asian water monitor — is the company mascot, and I was able to use this new process that makes the cookie look like mosaic tile. I did that for the lizard scales. Everyone should watch that episode because something crazy happens. The Osmond family hired you to to build a replica of their 150-year-old log cabin for a fundraiser to benefit the National Multiple Sclerosis Society. What was that like? It was such an honor. Alan and his son David have MS. And I have MS, so that was pretty special for me. When you talk to other people who have the disease, you are automatically connected; you’re kind of in this club that you do not necessarily want to be in. I really wanted to do something special, so we incorporated personal details into the piece like edible art and tiny fondant furniture. To see their faces when they saw the build — it was a magical moment.